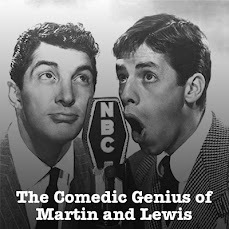 On the Martin and Lewis Old Time Radio Podcast this week we continue to enjoy the Halloween season with an April 18th, 1952 NBC Radio Broadcast of The Dean Martin and Jerry Lewis Show. The boys welcome Boris Karloff to the program. Dino sings You Must Have Been A Beautiful Baby, 50s favorite The Little White Cloud That Cried and Western classic Empty Saddles. The special offers mentioned in this show are no longer valid. This program was licensed by ASCAP and BMI. The old time radio program presented is a work in the Public Domain. On the Podcast this week we reach back into the archives for a May 8th, 1949 NBC Radio Broadcast of The Dean Martin and Jerry Lewis Show. The boys welcome a very spooky Peter Lorre to the program. Dino sings Someone Like You and Again. The special offers mentioned in this episode are no longer valid. This program was licensed by ASCAP and BMI. The old time radio program presented is a work in the Public Domain. The old time radio program presented is a work in the Public Domain.